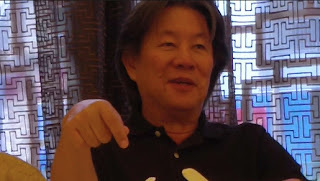 Here's the rest of the interview with Mr Lim Yau. You can read the first part of the interview here. Qn: When you are conducting especially new music, you might meet certain things that you are not so familiar with or you don't know what to do for certain parts, how do you approach such instances? Ans: I'll ask. Nowadays the communication is so much easier. I remember in the 1980s when I started doing this, when the composers were not in town, or hasn't arrived yet, you need to communicate much earlier, especially notation. Some composers are very thorough, they know that you wouldn't have any idea what it is, what are those signs. And they've put full of notes there to explain to you how to play these notations. But others, they are not so thoughtful, they think that everybody can read their minds and that's where you have to communicate much earlier to find out. And sometimes it's not easy just by writing. It's best that you call this person directly, to find out how to play these passages. There are standard modern or avant-garde notation guidance periodically, like 1974 or 1990, but in this day and age, the composers' possibilities are so wide that sometimes they write something, certain notation, that you really don't know what it is like. So like this time for example, we also encounter some, like the crescendo diminuendo signs which are just completely like a mess of lines, until she explained, we also don't know what it is. Qn: In a performance, one of the main aims is to get the audience to appreciate the music and enjoy the music, so especially for contemporary performances, how do you make sure the audience understands and enjoy the music? Ans: We were lucky! I thought the audience size last night was not too small. I remember in 1983, one or two years after I came back from my studies from the Royal College of Music, I did a concert of works by Leong Yoon Pin, Phoon Yew Tien, and Bernard Tan. The concert was called the "New Music Forum", it was at the old Victoria Concert Hall, then it was very new. The seating capacity was something like 800, we had about 200 in the audience. So if that is any number for you to guage, actually, we were rather encouraged by that, thinking that wow, 200 people is not bad. 200 audience size is not bad. The New Music Forum went on three times and each time there is an increase of audience size. You cannot ensure that they will enjoy it, but you should probably prepare them and urge them to listen to what they are about to listen to, with a very open mind. I didn't manage to hear what Jean said to the audience, but that is certainly needed, to have either the composer or the composer and the performer or just the performer to bridge the gap. Talk briefly about the piece. That hopefully will relax the audience, or prepare them to what we're about to give them. Open-mindedness is important. Of course, the audience either were there because they were asked to go there, or they want to avoid the rush hour so they don't mind sitting there, or purely curious about it. Of course, we hope that the entire audience are a curious audience and that would be fantastic because that's how performing arts or arts in general should hope to reach. If everybody is like a very traditional SSO audience, then that's very hard. They only go to the concert when they see the poster of the solo appear in HMV. If HMV does not have this poster, they will not go. And that does not go down well for the future of art. We should have constantly, an ever enlarging audience size that is curious, I don't know who Jean Foo is, it looks interesting, and I'm going to go there to listen to it. Because through that open-mindedness, you are rewarded with certain provocation of your own creativity. You actually will leave the concert with a more stimulated mind. And I think this is what we really need, especially in Singapore. Qn: There is quite a big difference in the aesthetic views of traditional music and contemporary music. You've conducted both. How do you approach these two very different aesthetic views and approach the music? Ans: Actually, I approach them the same way. Either it is very well organized sound, or it seems like sounds that are created at random. There is bound to be some form and structure, even structure-less itself is a structure. And from there you have to then measure them by the period they were produced. Because you then associate the historical aspects, the social, or even the political approach to it, and then from there you merge your knowledge of that period and then you form a concept and then you perform it. So for me, it's the same. You pack, like the composer the eight minutes or the thirty minutes with a planned sound. And you have to be able to read what he has planned, have it in your mind, and encourage that eight minutes or thirty minutes out of that ensemble you are facing. And if you succeeded in that, then the experience is a worthwhile one. Qn: Being in the music scene as a professional for more than thirty years, what is the greatest joy you derive from music? Ans: I don't have to be conducting it to feel the joy. Of course if you are part of it and when in the very rare occasions when you feel that you have grasped the essense of the piece of music, that is a wonderful moment. It doesn't happen always though, there are so many concerts you give, after you walk to the backstage, you really don't wish to talk about it. But in the very few moments when you feel that it really went the way it ought to be, the way the performance, the performer and your understanding of it and your guidance of it really makes the whole performance sound right, you probably feel that you are in the presence of God. Very rare moments. I have no religion, but when that moment hits you, you can't help but feel rather religious. Qn: Having seen and experienced the changing musical landscape of the past few decades, do you have any advice to give to the younger generation who wish to pursue the musical career? Ans: Well, I will judt quote from my very illustrious colleague, Leonard Bernstein. He has said in one of his interviews that "if you ask yourself, should I be a professional musician, then you better don't be." And the reason is because you asked. You know what it means right? It's hard work. It must be something that you really want to, believe in it and it's the only thing you want to do. Then you will find that when you encounter problems, you will not feel so disappointed. If there is any advice for young people, two things. One is again, never regret it. And the second thing is, there is no shortcut. You need to spend time. With your instrument. You need to spend time writing if you are a composer. Just like a writer. You must have the discipline to say everyday I sit down and write two thousand words. Everyday. And a performer too. You need to have the discipline of wanting to practice on a daily basis. Because there is really no shortcuts. Qn: What do you think about the music scene in Singapore? And Singapore music? Do you think that there is or there can be Singapore music? Ans: Of course, there can be Singapore music. The question is, well, it's very much similar to America, to Australia, they are all immigrant societies. And it will take time. Something that you cannot rush. And something that you cannot hope to be artificially assembled. 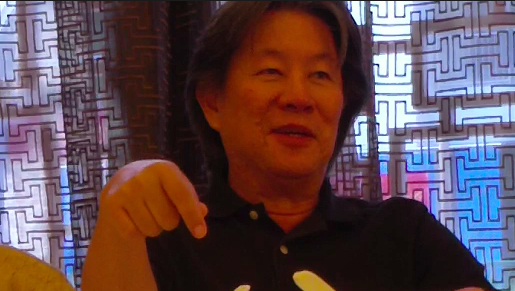 I ever asked Leong Yoon Pin, what do you think? What is Singapore music? He stared at me and he said, I'm a Singaporean, I compose in Singapore, this is Singapore music. And I think he is right. 這個東西不能夠強求的。(This thing cannot be forced.) You go ahead and do, because you breathe the Singapore air, you speak with a Singapore accent, and that is Singapore music. But over the course of time, of course it will transform itself. And I think it's less important to define what is Singapore music, but have the confidence in writing music. That is more important. We have passed the very very early stage of wanting to artificially create the Singapore culture. We are now much more confident as a nation. And I think nobody is talking about the rojak type of man-made culture. As long as we have the opportunity and the government support, allowing the 百花齊放, one day, the real Singapore culture and Singapore music will emerge. It's going to take time. Look at America, and look at Australia. It's probably still finding its way. But America at least they could claim there was a Copland, and that's the older generation, and now they have the Steve Reich, they have John Adams, Philip Glass, they are well and truly American music. Ya, one day, just be patient. And keep doing a lot of Jean Foo type of concerts. I think one day it will come.